Cranes, and the people who operate them, are hard at work all over the world every day. If you’ve passed a large construction site, you’ve most likely seen a tower crane, commonly used for the movement of heavy materials and equipment. Just about every shipping container you’ve ever seen, and the freight that it holds, has been loaded and unloaded by a gantry crane. Take into account the fact that overhead cranes are used for just about every step of production in the automotive and steel industries, and it becomes clear how important cranes and the people who operate them are to the industrial world. Just like every other piece of heavy equipment, crane operator training is of paramount importance, and this training must be high-quality, cost effective, and have no impact on production – a perfect application for training simulators. 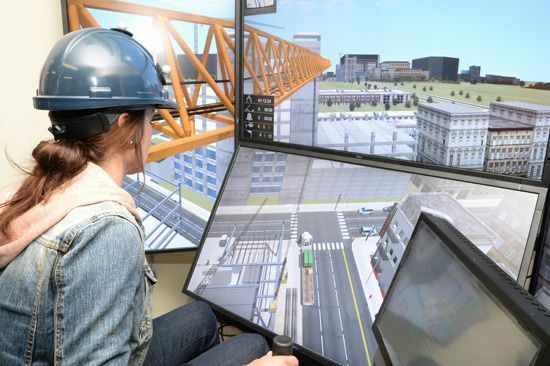 Last month, the Operating Engineers College (OEC) in Holyrood, Newfoundland, launched their new Tower Crane Operating Program, featuring virtual crane simulators for students to train on. The OEC plans to use this simulation-based training facility in order to produce the large number of crane operators that will be required to construct the $14 billion ExxonMobil Hebron project in Newfoundland and Labrador, Canada. The centerpiece of the Hebron project will be a stand-along gravity-based offshore oil platform that is being constructed on top of the Hebron oil field, estimated to contain at least 660 million barrels of recoverable resources. The platform is being developed to withstand severe ocean conditions, including sea ice and icebergs, for a period of at least 40 years, with the capability of producing up to 150,000 barrels of oil per day. Clearly the operators who will be responsible for developing the platform to meet these production estimates will need the best possible training, so it comes as no surprise that significant investments in training simulators are being made for the project. Crane training simulators allow you to provide uninterrupted hands-on training to your operators, with the ability for managers to track and analyze their digital training records. This training can be custom tailored to meet your specific requirements, including emergency operation conditions, which are often difficult or impossible to train for. Training simulators keep operators safe, training costs low, and pose no disruption to production. With the worldwide demand for energy-based resources always on the rise, it stands to reason that projects like the one on the Hebron oil field will become more common as well. With projects like this on the rise, the demand for highly-skilled crane and heavy equipment operators will rise in parallel, leading to an increased demand for simulators to train the operators that will be required.